This is the second special needs session that I have done as a volunteer for the organization Hope Kids www.hopekids.org. 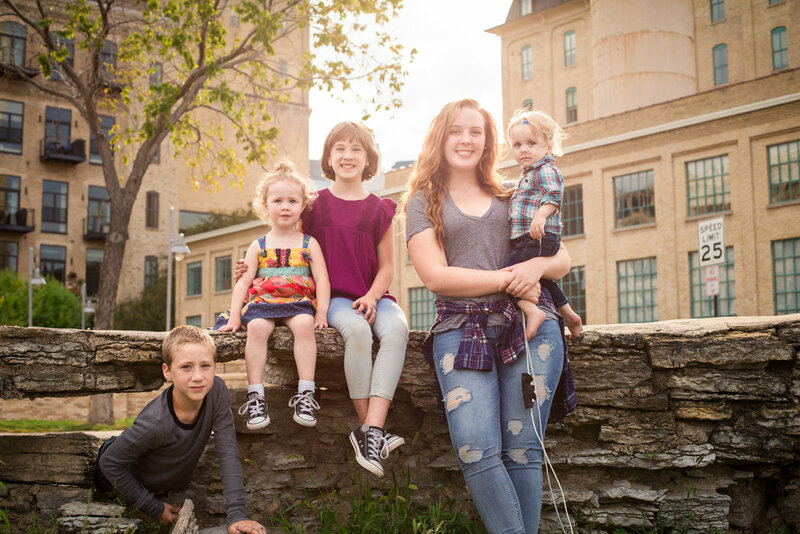 I had the honor of joining Jill and Chad Voerste by the Stone Arch Bridge in Minneapolis a few weeks ago for a family photo session with their beautiful children Myranda, Trevor, Lacey, Elizabeth, and Deacon James. 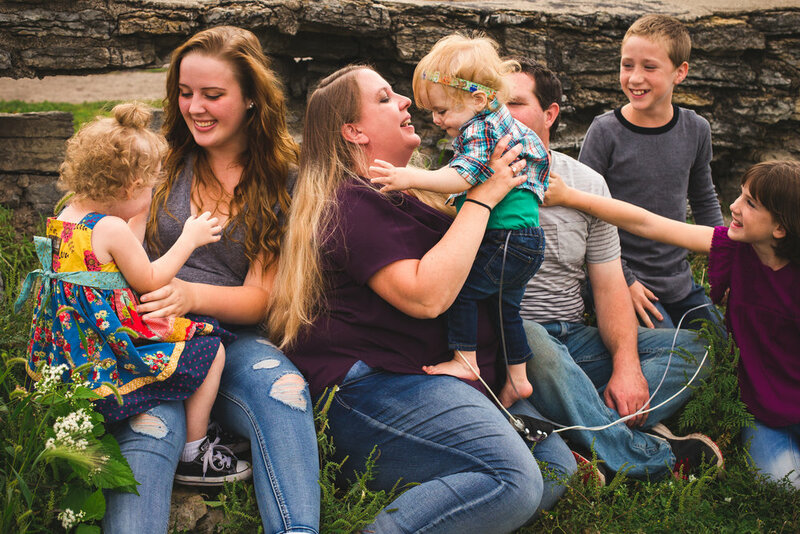 This blended family has an incredible love for each other that shone through the entire session. 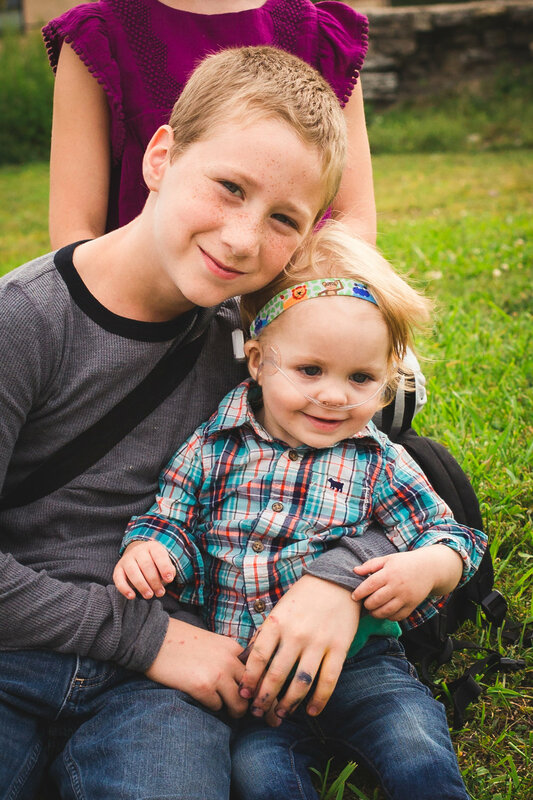 Despite the many stresses and trials that they have faced due to life-threatening illnesses facing Elizabeth, 3, and Deacon James, 18 months, they are a family of incredible faith who lean heavily on Jesus and the assurance that He is in control of their lives. Their faith is a wonderful testimony of how God’s grace can help us rise above adversity and see the beautiful blessings that are there. Elizabeth is a beautiful and vivacious 3 year old who wears twirly dresses, has an angelic smile (with a little bit of mischief mixed in) and is just plain sweet! One would never know that she has an autoimmune disorder called I.T.P. which causes her immune system to malfunction and destroy blood platelets. As a result she has been hospitalized frequently and has undergone chemotherapy. Deacon James is a toddler on the go! His personality is huge and his smile is contagious. Deacon was born with a rare genetic disorder called 2Q11.2 duplication caused by an extra copy of a small piece of chromosome 22. Diagnosing this disorder did not come easily and was an incredibly frustrating process for Jill and Chad. After several trips to the E.R. and misdiagnoses from several doctors, Jill and Chad had to advocate that something was very wrong with their precious baby and, no, it was not just a virus. Deacon has a host of medical conditions stemming from this disorder, but the extent of his health and developmental issues are still being determined by a team of 20 specialists from Children’s Hospital and Gillette Children’s Hospital. 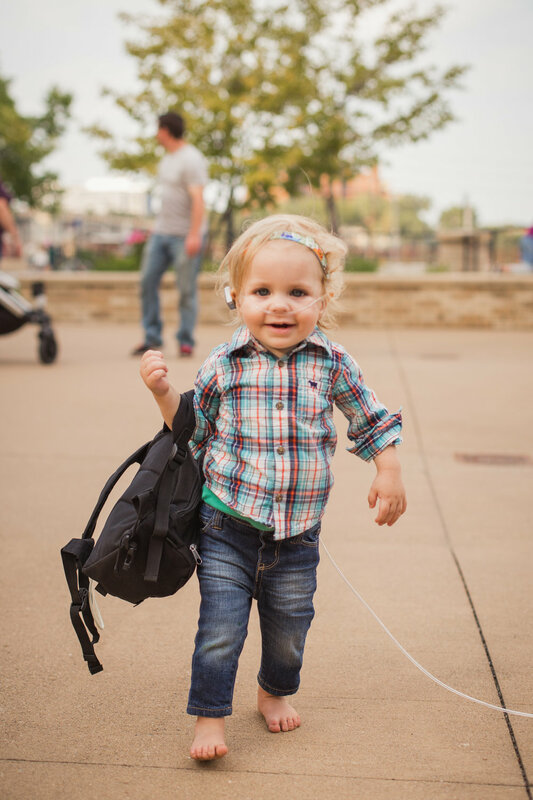 The list of his current struggles includes: conductive hearing loss, bi-lateral hip dysplasia, developmental and speech delays, sensory issues, chronic pain syndrome, and laryngomalacia in which the upper larynx collapses inward during inhalation, causing airway obstruction. As a result of this condition, Deacon is on a breathing tube, has been on a G tube, and must undergo feeding therapy because he aspirates easily. The list of surgeries and tests from the time he was 2 months old to the present is longer than most people ever experience in their lifetime. He requires constant hospital-level care. Jill’s day is filled with continual doctor visits and care on top of managing the busyness of life with 5 kids. She says that despite the time and attention that her littlest ones require, her family has been brought even closer together through these circumstances. The constant hospitalizations, doctor visits, therapies and resulting financial stresses would tear many families apart. However, she says that all of these things have forced their family to surrender all control to God and they have had to increase their trust in Him to care for them, even when circumstances seemed impossible. Even in the darkest moments, she is now able to see the light of His blessings in the smallest details. Elizabeth and Deacon’s conditions require that they receive continual care forcing her to stay home as well. Since she is a registered nurse, she is now able to be paid to stay home and be Deacon’s nursing provider. An incredible blessing. When the weeks are consumed with doctor appointments and little time is left for the demands of normal family life, an activity offered by Hope Kids- something which blesses the whole family like a Twins Game or a trip to the zoo, will pop up and provides them with a much needed break and to simply have fun. Another blessing. When money has been tight, and they don’t know how they will make ends meet, provision has always come through, sometimes, in miraculous ways. Again, blessings. 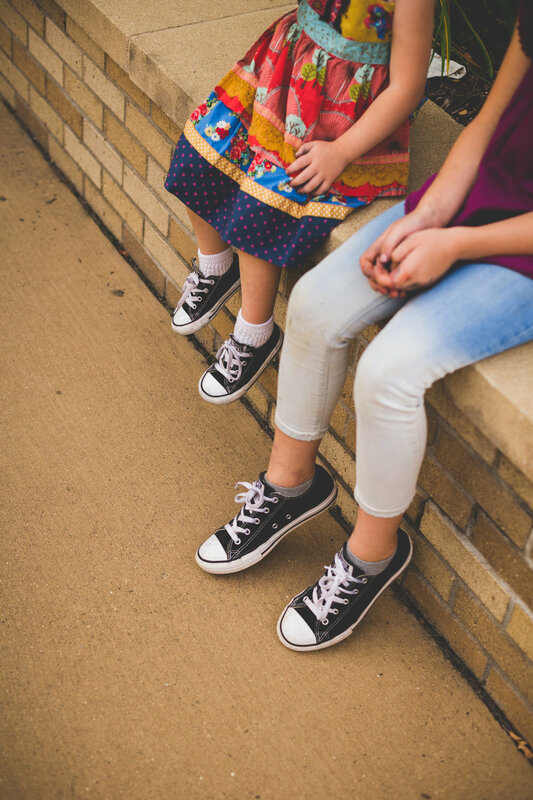 When kids are kids and do something to drive them crazy, a big brother will selflessly tie his sister’s shoe, a little sister will give a hug to her crying brother, a story will be read to a little sister, or the youngest will beam the biggest smile towards them all. These are Blessings. Blessings which carry them through. Blessings which bring hope to their lives. The lesson? You simply have to open your eyes to the blessings before you. No blessing is too small. As a result, there is Hope. Hope which humbles hearts and makes striving tendencies cease. In this session, I tried to capture the incredible relationship that this family has with one another. The love between them is palatable and filled me with such joy. Nothing deters their hope. Their patient endurance is inspiring. Deacon is simply a normal toddler who desires to run around and explore. He carries his oxygen tank around like a trooper! He doesn’t let it steal his joy. It is simply a part of his day to day life. He keeps his eyes focused on the beauty of the world around him, wiggles out of his mom’s arms, and lives free in the joy of the moment. 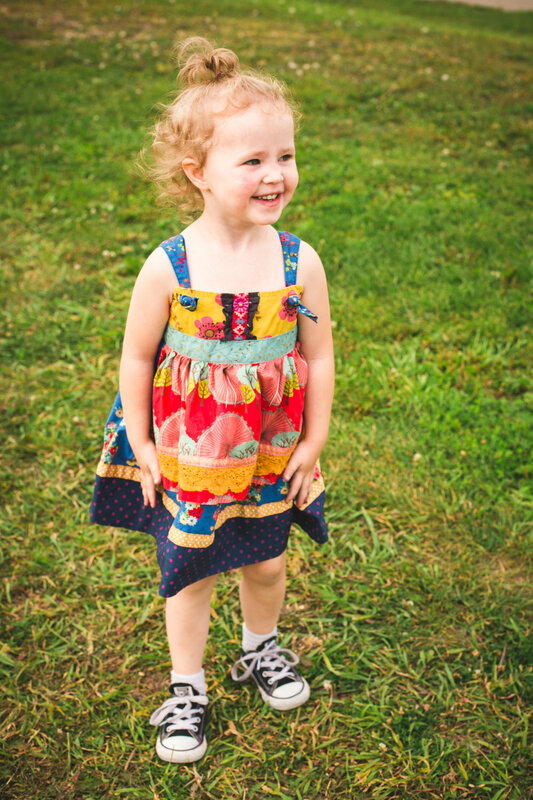 Elizabeth (or “Z” as they call her) doesn’t live in fear of being sick or hurt, but twirls in her pretty dress, smells the flowers, and cuddles with her big brother and sisters. We can learn so much from these little ones! Our trials do not have to hold us back, but we are free to simply live because we know that one day, our suffering will cease. Someday, one day, because of what God has done for us, they will disappear, but our joy will not. Jill said that the song “But even if…” inspires her family each day. It has helped them to hang on to the truth that their strength is not from themselves, but from what God has done and is doing for them each day. All they have to do is hang on to the hope that this provides. Winter can be a magical time for family photos! Stories of Strength and Hope is a collection of stories of families who have a loved one facing a disability or chronic or terminal illness. These stories share the details of their challenges while reflecting the strength and hope that have resulted through every step of their journey. Meet a boy who has overcome all expectations through the miracles that God has done in his and his family’s lives. 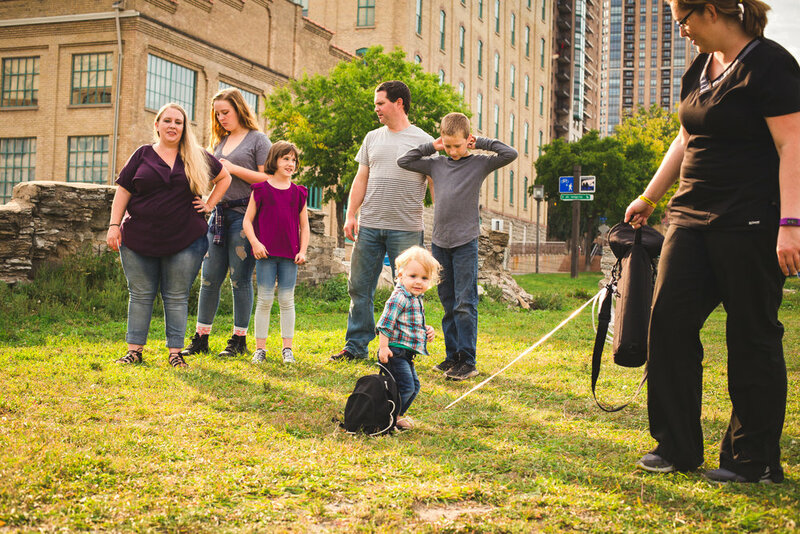 My second HopeKids Minnesota Family photo session that teaches us a valuable lesson. Live your life in the moment. A simple, yet incredibly powerful statement that breaks through our fears and offers us Hope. This is a continuation of my series of Hope Kids Sessions. 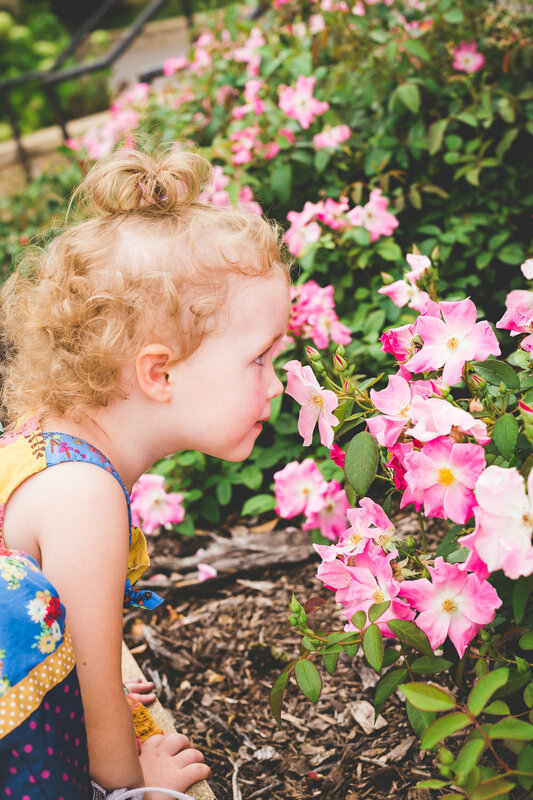 These special needs family photography sessions are a venue through which families with a child who is facing a challenging disability or illness are able to share the story of their journey and the Hope that results from their experiences. Through these stories we see struggles which help us realize we are not alone. We see trust when everything else is out of control. And we discover the things which are most valuable in life: “hope, faith. and love, but the greatest of these is love.” I Corinthians 13:13.